Most of us may consider the alcohol just like a drink but in actual, it is a poison and can sometimes have lethal consequences. Human body can only process one unit of alcohol an hour. Drink a lot in a short space of time and the amount of alcohol in the blood can stop the body from working properly. Alcohol consumption is a widespread habit and mostly people consider it as a bad habit. Scientific studies showed that alcohol has a negative impact on all of our bodies including dehydration, depriving cells from their precious nutrients. In addition to these main effects, it also affects internal organs, especially the liver, if it is being used for long. It can destroy neurons, which are considered the most important cells in human body. After every drink, alcohol poisoning taking these damages to a higher level. In addition to above mentioned long term effects, there are many immediate effects of alcohol such as it can slow down human brain functions and as a result, the consumer can lose sense of balance. It irritates the stomach which causes vomiting. You can choke on, or inhale, your own vomit into your lungs. It affects the nerves that control your breathing and heartbeat, stopping both. It lowers your blood sugar levels, so you could have seizures. Shortly after drinking, you can feel that your body temperature is extremely lower. Dehydration is one of the most dangerous effects on body which can cause irreparable loss to your nervous system. 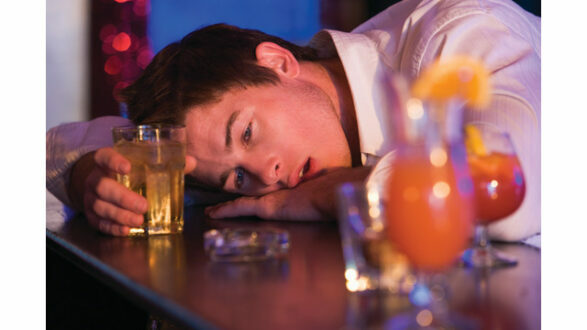 You may interested in symptoms and treatment of alcohol poisoning, then continue reading. If you are not habitual drinker than you may not need to drink too much to experience alcohol poisoning. Everybody has a different limit of alcohol ingestion which is highly dependent on body weight. If you are drinking in your limit than alcohol consumption will not pose any danger. But once that limit is exceeded, then alcohol poisoning symptoms will get installed. At the moment, you feel slightly dizzy or euphoric, you have been intoxicated with alcohol. You should stop consumption at this point. If you couldn’t stop yourself and carry on consumption then drinking too much will have an effect on your normal brain functions, like awareness, coordination, memory and breathing correctly. You may know that breathing is a reflexive self-protecting action, so your body does it automatically. But excess alcohol can slow down this function, to the point a person forgets to breath. Alcohol is a depressant that works on the central nervous system. You will experience alcohol withdrawal effects on next day. These involves nausea, trembling, shaking, headaches, lethargy, even vomiting. Some people may also have diarrhea, as the alcohol may have irritated your bowels. If your system can’t get rid of overdose then you may still be experiencing brain fog, disorientation, difficulty in concentrating, stomach pains and diarrhea, nausea, headaches, till whole week. Like any other substance like lactose in milk, alcohol does contain compounds that may cause allergies. Thus, drinking alcohol may trigger these allergies. Barley, yeast, wheat, gluten, hops, histamines and sulfides, are alcohol allergens. People who are suffering from allergies to these substances, only a very small amount can cause them severe health issues. The symptoms of alcohol allergy may include stomach pains, breathing becomes a difficulty, and even collapse may occur in acute cases. In addition, headaches, stuffy or runny nose, nausea, heartburn, vomiting, and increases in heart beats are among the common symptoms of alcoholic allergies. You are unable to limit the quantity of alcohol you consume. Body of regular drinker start building alcohol resistance so consumer end up increasing the quantities to feel the effects. Alcohol addicted person feels always need to drink something, and this feeling is strong. Drinker may start feeling nervous or irritated, especially when time for drinking approaches, and he don’t have any alcohol around. The worst effect of heavy alcohol consumption is that drinker starts experiencing problems regarding social and personal relationship, issues at work and even with money. Try drinking as much water as possible, because alcohol will severely dehydrate your body. To overcome dehydration, drink herbal teas or fruit juice made out of freshly squeezed fruits. Try to make some physical exercises as it will help your body sweat out the toxins. By any mean, do not drink any beverage with alcohol. Your system is still fighting to get rid of the overdose. Avoid fried and junk food. Your liver has a hard enough job to clean out the alcohol, and then to tackle some more of fats and unhealthy food.